A game of caravans in the desert. Reiner Knizia is, without doubt, one of the giants of the boardgame industry, and deserves a great deal of respect. But the recent fashion for looking back at his games as exemplars of themeing seemed, to me, to be grasping at straws somewhat. His mechanics are clever, but many reprints and revamps have shown how incidental the themes can be (with a few definite exceptions like Lord of the Rings). That said, it is hard to imagine Through the Desert as being made with anything other than those iconic pastel-coloured camels that look so much like sweets. Z-Man Games were smart to realise the fact and this new version just ups the quality quotient on all fronts without changing anything that makes the game such a classic area-control favourite. It’s one I didn’t have in my collection so I was very glad to grab this attractive edition. 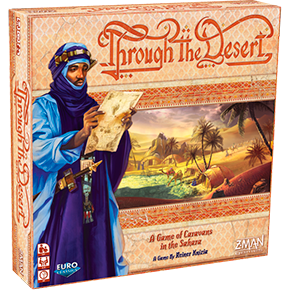 And now, like many thousands of people before me, I just have to resist the urge to pop those little camels in my mouth mid-game.